In this first part of what is expected to be a 3-part series we discuss the importance of YouTube for business marketing because of its critical role both as a stand-alone search engine, and as a provider of results to Google’s main search engine. When we start doing SEO and digital marketing for a new client we always need to request access to their Google Analytics accounts. In most cases where companies have used SEO and marketing agencies or consultants in the past, they have shared their Google login credentials as a way to let that entity into their account. So how does that sound to you? Well, if you have even a moderately cautious nature you probably hesitate to give the keys to your Google Analytics account to just anyone, much less a company you’re just beginning a relationship with. And you don’t have to. Any professional digital marketing agency should be more than satisfied with the solution illustrated in this video. Use it and keep your analytics account secure! Hi. 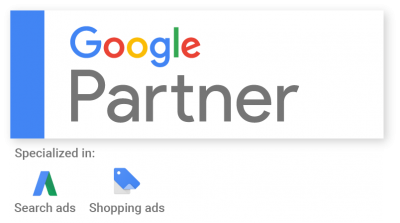 This is Ross with Horizon Web Marketing and this is a quick tutorial video to show you how to add a user to your Google Analytics account in order to give them access to the account. So here you’ll see, this is a demo of Google Analytics account and I’m assuming at this point that you know how to log yourself into Google Analytics. And if you do [log into Google Analytics] you normally are given this dashboard or one that looks similar to it. And now you have an opportunity to add a user and we often will make a request of clients that we work with that they give us access to their Google Analytics account so that we can either manage it or do diagnostics on their site. So you go down to the lower left there where it says Admin. Click on that and you’ll be given this panel here and Google allows you to change things that have to do with your account, your property or your view. Now you don’t need to understand what those three things are in order to do this process. All you need to do is go to the account level which is normally where we need to have access. Click on User Management. It will show you what users are already granted access to this particular account. And then you’ll notice up here at the top right there’s a little blue or a white plus and a blue circle. You click on that and then we’re going to click on Add New Users. Then you need to be able to do an email address that is a valid email address. So in this case I’m going to say Ross@HorizonWebMarketing. Then you have the chance to leave this by default. It’s checked and that is to notify new users by email. But if the person you’re adding doesn’t need to get an email you can just go ahead and un-tick that. And then you also have a chance here to be able to enable certain levels of permissions. Now normally when we ask for access to account we want to have all permissions at least above the line here. Now to give full permissions you also need to tick this box here that says Manage Users and normally is you want somebody to be able to add other users to your Google Analytics account you’re going to have tick that box. With respect to, for example giving access to a SEO Agency typically they’re going to want to have access these three and if you tick the top box here it’s going to by default, enable the other two. So at this point we are done with our job and now that new user is going to appear. And here I am, Ross@HorizonWebMarketing and then you’ll be able to see what the various levels of permissions are under the permissions column. And once you’re done all you have to do is exit out. You can go back to the home screen of your Google Analytics property and you’re done. I hope this has been useful. Our Next SEO Workshop Training is Coming Up Soon! 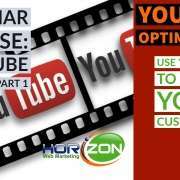 Why does Horizon do SEO Workshops? Well, we’ve always realized that the best SEO client we can have is one who understands what we’re doing for them and who can participate in the process. We have taken the time to explain and educate to all of our clients. Some of them were eager to learn, others not so much. Our 5-day program is progressive and structured to begin at a very basic level. 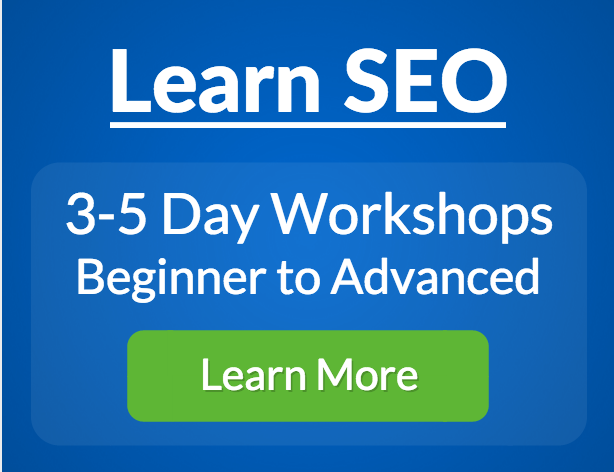 Even if you’ve never done SEO, this workshop will get you started. On days 1 and 2 we cover the basics of SEO, and in days 3-5 we take you into more advanced topics. If you want to finally do SEO the right way, and you’re tired of trying to figure that out by wading through a hodge podge of SEO videos on YouTube, you owe it to yourself to sign up for one of our SEO workshops. Sign up links are below for all the courses. https://www.horizonwebmarketing.com/wp-content/uploads/2018/07/get-seo-right-illustration-with-words-e1530907759625.png 496 800 Ross Barefoot https://www.horizonwebmarketing.com/wp-content/uploads/2017/07/horizon-web-marketing.png Ross Barefoot2018-07-06 20:10:122019-03-06 20:34:08Our Next SEO Workshop Training is Coming Up Soon! 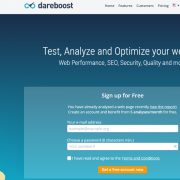 In our latest series on SEO checkers (aka Website Analyzers, aka SEO check up tools), we take a look at Dareboost. This may not be the best choice for someone who has no technical knowledge of website development, however if you have even a basic level of understanding you will find a lot of value here. I will take you on a quick tour of the program in the video. For those of you who’d rather read than watch, well, first, more power to you, but secondly, look below the video for our audio transcript. Dare I say it? 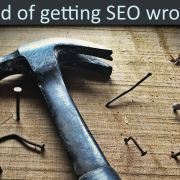 It’s time for another SEO checker check up. I’ll be right back, in a moment. Hi, I’m Ross with Horizon Web Marketing and as you probably know, we’ve been working through a number of different, free, SEO check up tools, that are available online, that purport to help you be able to take your webpage and plug it in and see how it can be improved from an SEO perspective. Now we’ve done a number of these tools, the next one on my list is a tool called ‘Dareboost.’ So, let’s see if Dareboost can get the job done. Here we see Dareboost when you arrive at the website, actually I’ve been here before, as you can see down here, it knows that I’ve already done a check. Now when we do these, we’re using a demo site, basically, called ‘Artisans of Colorado.’ And we’ve been using the same site throughout so we’d have something to compare. So I went ahead and plugged Artisans of Colorado into Dareboost and it comes back with, a very familiar interface here, it’s got a numeric grade, it tells me it’s 68%, they’ll tell me it has 11 issues, 15 suggestions for improvement, 63 areas where it has passed the test. It does a lot of things right, it is able to spot a lot of issues, but often at a level where you’re gonna have to have some technical knowledge to be able to even understand the issue, much less to be able to correct it. So let’s just scroll down here and see what it looks like. 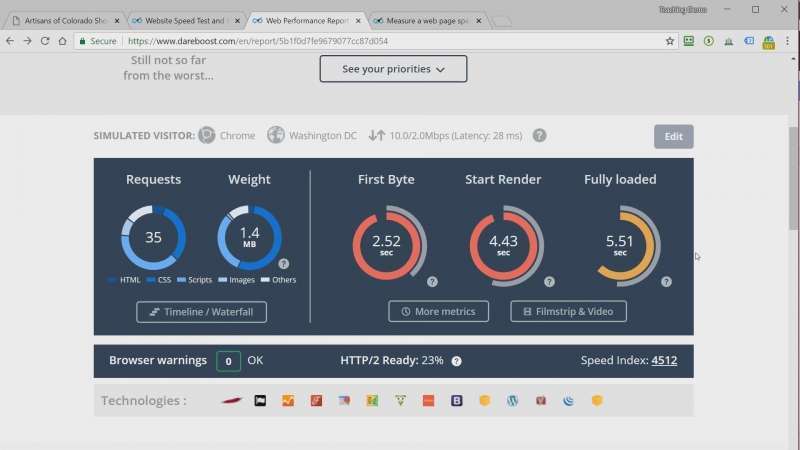 It puts a lot of weight on the speed test, putting it at the top and center of the report screen here. And it gives me a lot of very good information when it comes to the speed of the website. It’ll give me details such as the first bite, start render, fully loaded, so in other words, it doesn’t just give you a number, “Oh, your page took X amount of time to load,” and that’s a good thing, because Google is evaluating your page based on things like ‘when does a user first have an experience with your page.’ So in this case, it’s giving me a lot of metrics and then as I drop down below, it’ll give me the tips and best practices. 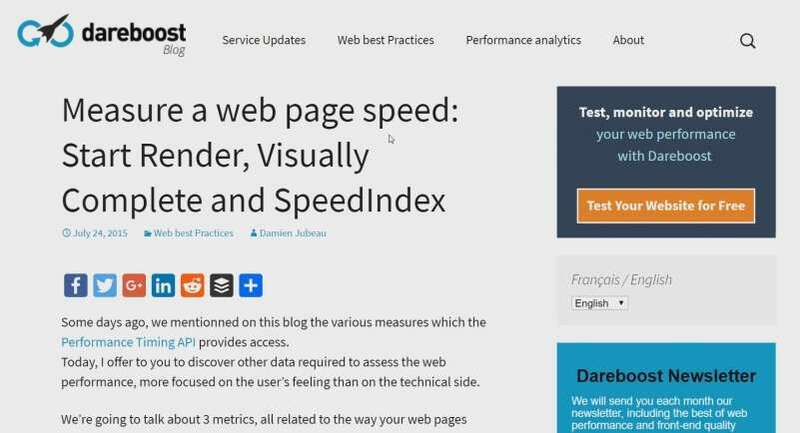 Website speed metrics are granular and front and center. These are things, that if you’re new to SEO, even if you’re experienced with the SEO but you don’t know much about website development, you’re gonna have a hard time wrestling with some of these issues. But if you do have some knowledge of these areas, it gives you a lot of granularity and a lot of detail that’s very, very useful. So, I’m just going to pick out a few things here, as I go down, and one thing I would like to point out is the interface does allow you to hide or reveal, the information. Like for example, it’s talking here about a critical dependency that’s detected, I was able to drop this down, it tells me about what … It’s referred to as a ‘front end single point of failure.’ Here again, we get into some of the text speak that is very common to Dareboost, when it does one of these checks. Now, I’ve brought up here, this is a different blog post, but one of the things that I also like about Dareboost, is they do give you links, not just to kind of a ‘hover over’ tip on what a particular metric or particular diagnosis is about. But they’ll actually do a pretty good blog post, giving you a lot of information. So if you’ve got patience and if you are able to engage with their information, they’ve done a really good job on a lot of these subjects, of being able to educate you and I’d say that has a lot of value, right there. As I drop down, I can see … it’ll show me quite a few items here, that require attention. One of the things that I like, just from an SEO perspective, is they do a thing like, it will check that there’s duplicate title tags on this page. We’ve thrown a duplicate title tag into this page, just to see whether tools would pick up on it, and most tools don’t pick up on the fact that there’s a duplicate title tag. It also gives you a nice preview here of the ‘Cert snippet.’ By snippet, I mean how you’re listing is gonna appear and how your title tag might affect that particular display, in a Google search result. So let me just kinda scroll down here, you can see there’s a whole lot of speed and optimization issues. And the tool is pretty, I wouldn’t say it’s exclusively focused, but it’s got a heavy emphasis on performance issues. And if you’re a programmer out there, you can see they’ll call you out on things like here that other tools, typically, will not, using the exclamation important declaration, used 578 times, that’s basically something that you put into your CSS code. And again, unless you’re a developer, you won’t really know what that refers to, but if you are, it kinda shows you how you’re relying on something here, that you probably shouldn’t be relying on so heavily. So, again, there’s a lot of subtle things this tool will pick up on and I thought that was extremely good. 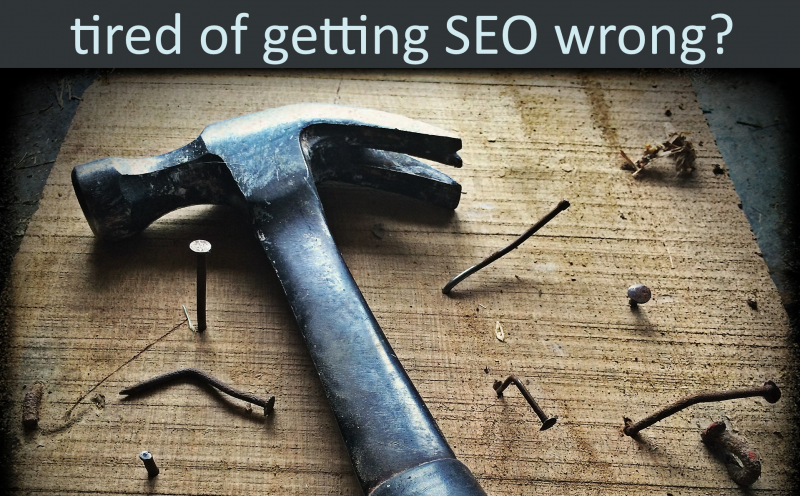 I just don’t think that the tool is really appropriate for someone who’s just getting in to SEO, unless they’re doing it, going through it with their developer or with an SEO professional. That having been said, once you’re a little bit farther down the path, this could be a very good resource. I’m certainly going to keep Dareboost bookmarked for the future. Let’s run the numbers on this, as you know we publish an SEO audit check list, at Horizon Web Marketing, and we offer it as a free resource. 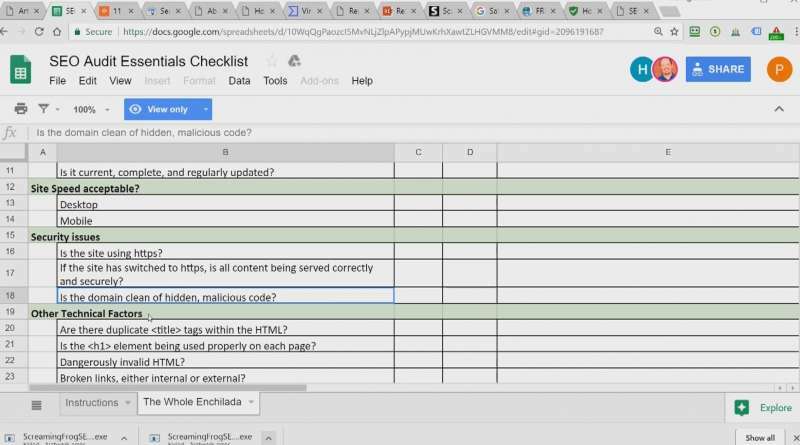 In the description for this video, I’ll give you a link to be able to download this audit check list. And we modify and update it on a regular basis. Now, the numbers here are pretty low, for Dareboost, I don’t think that should be a judgment on the tool, because, again, this check list is more relayed with a lot of items that have to do with things like, “Is the content relevant to your end user,” and so forth. And Dareboost doesn’t claim to be able to do that. So, the fact that it had got, it hit 11 out of 90 of our points, 6 out of 30 on the technical, would tend to indicate a pretty low score. And here I’ll scroll down, just kinda give you an idea of what these are. But I don’t think that that’s a really- a valid score in terms of judging this tool. I think the tool, overall, is a really neat tool. I like it quite a bit, so, definitely keep it in mind as one of the tools in your toolbox, and make use of it as you have the knowledge and experience to be able to do that. Now, if you want to get other reviews that we offer on free SEO tools, please subscribe. It’s also great if you subscribe, because it just shows YouTube that you support the channel. So go ahead and hit that subscribe button down below and if you’d like to actually receive notifications of our … of new videos that we publish, when you click on ‘subscribe,’ there’s gonna be a little bell icon next to that button. Just click on that as well, so you can actually get notifications now. We offer SEO consulting and SEO training at Horizon Web Marketing. Training is through the Horizon Web Marketing Academy. So definitely keep us in mind for any needs that you might have for SEO services or for SEO training, as you pursue your own Search Engine Optimization knowledge. And I will look forward to seeing you on our next video. Again, my name is Ross Barefoot with Horizon Web Marketing. I’ll see you next time. 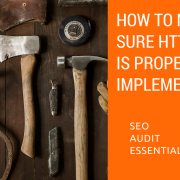 This is another video in our series of SEO Audit Essentials how-to’s. In this video I discuss one of the items we always check when we’re doing an audit on a website, namely whether it’s running on secure protocol (in other words, using “https” instead of “http”), and then, if it is, whether that https protocol has been implemented correctly (often it has not). Since Google is valuing https in their ranking we always want to make sure that Google doesn’t think the https implementation on a website is broken. It might negatively impact the trustworthiness of the site. An audio transcript appears below the video. Hi, everybody. This is Ross Barefoot with Horizon Web Marketing. I’m here with another tip for how to use our SEO audit checklist. 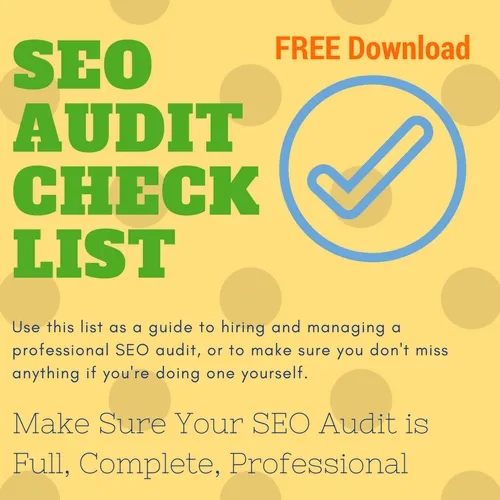 As you may already know, and may already have a copy, we offer as a free download a checklist similar to the one we use in house for performing an SEO audit on your website. So, we’re just going to drill down into one small aspect of that, and show you how you can do a check on your site. And in this case, it’s for the security protocol that your site is operating under. Let’s take a look at the checklist. You can see it here. It’s set up in a spreadsheet format. If we scroll down a little bit, you’ll see it there’s a setting that says security issues. And the first question is, is the site using HTTPS? Of course, as you probably know, Google is pushing everyone to use a secure protocol and here I’ve got a project site to take a look at. 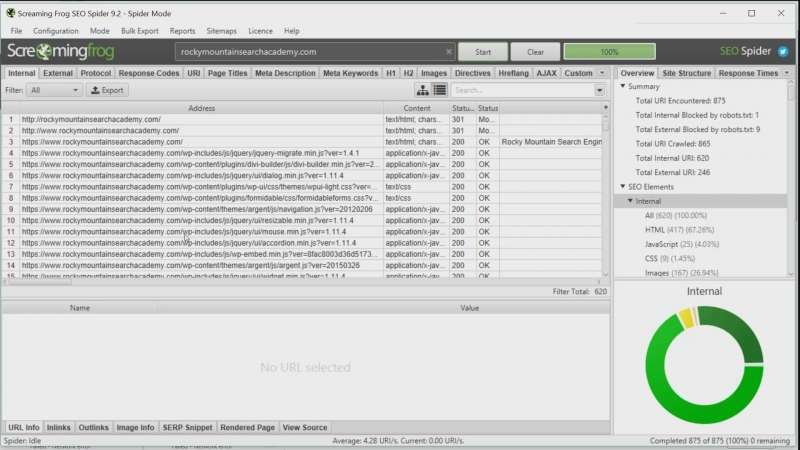 You’ll see up at the top left that the site is using HTTPS, as opposed to just HTTP. Whenever you visit a website, typically, if it’s running this secure protocol, if you’re using Chrome browser, it’s going to show secure, other browsers will show something similar. Your first step is, if you’re going to check out your site is try typing in the address, just like I’ve done it here without any protocol [ed: without http or https] and hit Enter, and then see what it defaults to. In this case, it defaults to HTTPS. So, so far, so good. I’d click around to a few pages on a few links, see if it’s running HTTPS. Okay, so at this real basic level, it looks to be running HTTPS. But I’m going to check one other thing, and that is what about if somebody has a link out there with just the standard old-fashioned HTTP? So, I’m going to put that in for this site and I’m going to hit enter. Now notice that it redirects again to HTTPS. So, some sites do not force it to check. Part of what you’re going to do is you’re going to check by taking out that S, and running it through and seeing if it redirects back to the secure protocol. But typically, you’re not done there. Now tool that we use quite a bit, and I’ve talked about on some of my other videos is Screaming Frog [ed: for a link to any tools mentioned in this video, see the description of the video on YouTube]. It’s free for up to about 500 URLs. It’s a free download. Otherwise, if you have to buy it, it’s a good tool to have. I’ll do other videos on what we use it for, a whole bunch of different stuff. I’ve done a crawl here on a somewhat abandoned site called rockymountainsearchacademy.com. Once I do a crawl using Screaming Frog, they have a report that is called insecure content. When you click on that, it’ll prompt you to download a spreadsheet. What the spreadsheet looks like is right here. You’ll notice that it will show me every page that has a link on it that points to an insecure destination. In this case, on my page, How To SEO Courses, you’ll see here under the column destination, notice how the protocol over here is HTTP. That’s not really the best case. Now in our situation, we do have what are called redirects in place. So, if someone clicks on that link, they are forced to a secure version of this page. But that puts an unnecessary step in the process. So, this would be an area that I would need to give some attention to, to change these links here to HTTPS. Now there’s one other free tool that I’m going to show you how to use. We’ll go back here, and we’ll check this tab. This is a cool little site called JitBit. You can go there and do an SSL check. Now, this will only go up to about 200 pages. But it gives you a good idea whether you might have a problem or not. Notice you have to tweet to gain access? That’s a small price to pay. So, I go ahead and tweet, and I’m going to show you what the result is when I did a check on Rocky Mountain search engine Academy. And you can see in the screen capture here, that it finds just one insecure item. Now, this is because it’s looking for actually where the website is calling some sort of a resource that is using something to build the page that is insecure. Now, this is something that Screaming Frog did not pick up on. And so, in essence, you really have to do a variety of different checks. At this point, if you find that you do have a problem, and you’re not really technical, here’s where you call in your developer or an outside developer if you feel that your developer, or the person you’re working with, can’t handle this. And you say, “Well, here’s what I find:” In the case of Rocky Mountain search Academy, I have a bunch of insecure links that need to be swapped out. That can be done with a one-step database replacement operation. I would also show them the JitBit document, because it shows where an external script is being called insecurely. Both of those are red flags to Google. And so, they would need to be dealt with. Once you deal with them, you can mark this off your list. Again, my name is Ross Barefoot with Horizon Web Marketing and Horizon Web Marketing Academy. I hope this has been useful to you. Please subscribe for more tips like this, and also click on the bell icon next to the subscribe button. That way, you’ll actually get a notification when we have new videos come out that will help you work through these tough SEO questions. Bye for now.